In a statement released by UNCW, officials said that although his words didn’t represent the views of the university, they were protected by the first amendment. 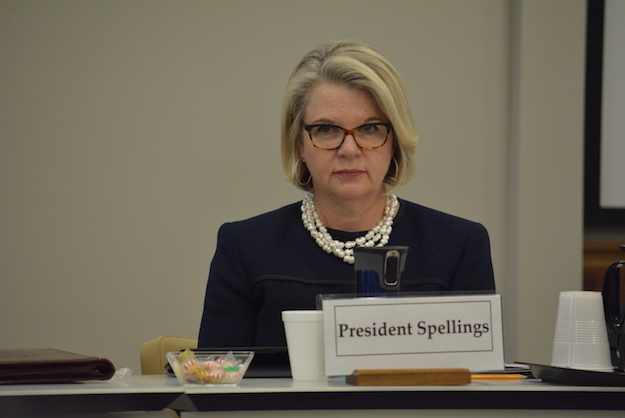 UNC System President Margaret Spellings said it’s a balancing act between making sure all are protected under the first amendment, but at the same time wanting to make sure all students feel safe. Secret Service agents then questioned her about the post. The agents did not find reason to believe Merghani posed a threat. But Adams said that it sounded like “a suicide mission” for those who did not know her. Spellings said she does not believe anyone else in the university system holds the same views as Adams, but that hate speech is protected by the constitution. Merghani spoke to Buzzfeed news in November and says she has since left UNCW because what Adams said “took a toll on her and severely affected her academic journey.” Merghani also said she felt unsafe at the university, and that Adams outed her because she had previously only identified herself as a queer Muslim woman on certain social media platforms. Spellings said it’s important for students to know and understand that there are options at UNC system schools to make sure their voices are heard. And to make sure they can feel safe on a day-to-day basis. Tell these kids to grow up. When they enter the real world, there may be no safe spaces, nor anyone that cares about their needs or their opinions. It is factually impossible to control all of humanity so that nobody ever holds a stereotypical view or doesn’t feel the need to keep their opinions to themselves.